The 2014 season of the Duvall Farmers Market is from May 1st thru October 9th from 3-7pm. 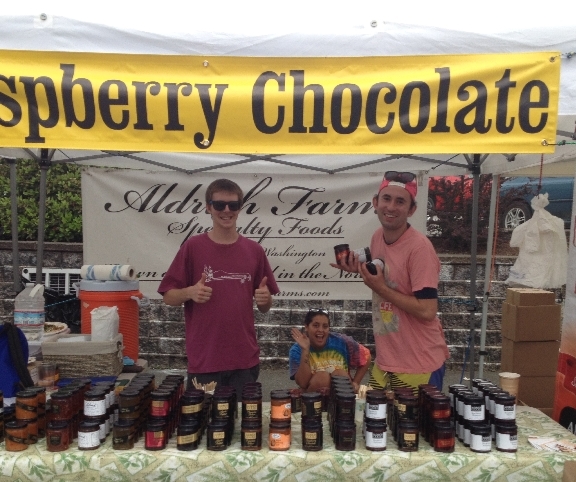 Aldrich Farms is a small Bellingham based business established in 1997. Only the best local ingredients go into their product line of gourmet jams, jellies, mustards, sauces and more. 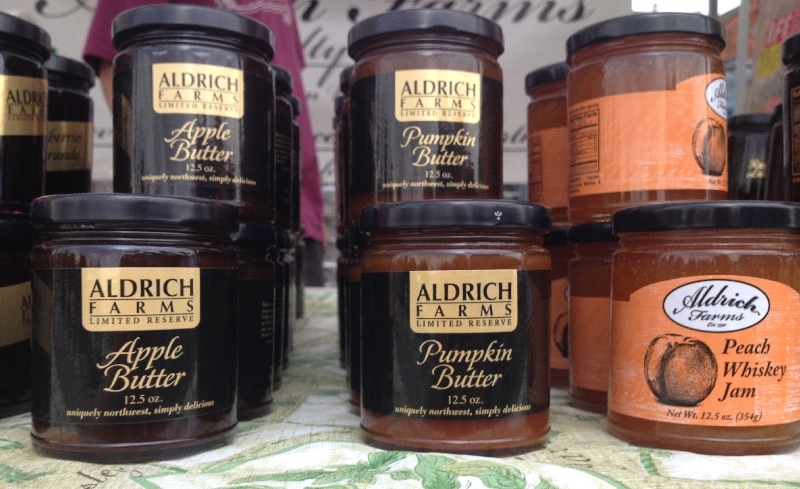 During its tenure, Aldrich Farms has gained distinction for unique and delicious flavor combinations, such as Raspberry Chocolate Jam, Raspberry Habanero Jam, Apricot Jalapeno Jam, Orange Pepper Jelly, Cranberry Pepper Jelly, Apple Garlic Pepper Jelly, Apple Chipotle Mustard, Sweet and Hot Mustard, and Champagne Mustard, just to name a few. In 2010 Aldrich Farms Sweet and Hot Mustard won a gold medal in the World Mustard Championships Sweet and Hot Division. They began by selling at local farmers’ markets and have expanded to festivals and markets throughout the Pacific Northwest, plus several retail outlets. Over the years Aldrich Farms has established a solid customer base that have come to expect nothing but the finest quality jams, jellies, and mustards. Aldrich Farms was recently purchased by Ron and Lisa Guier. They strongly believe in the mission of supporting local farmers and the local economy by continuing to source local fruit for all of their products. Ron ans Lisa are committed to offering the same level of quality in the jams, jellies, and mustards that their customer have come to expect. They continue to offer their products at several farmers markets throughout King, Snohomish, Skagit and Whatcom Counties, and can be found at the Duvall Farmers Market every Thursday. The Duvall Farmers Market is happy to support the Fresh Bucks program at the market again this year. Fresh Bucks provides consumers who receive SNAP/EBT benefits with extra buying power (Supplemental Nutrition Assistance Program, formerly known as food stamps). By matching up to $10 spent per SNAP/EBT card holder on each visit to the Duvall Farmers Market, participants are able to purchase more produce from local farmers. 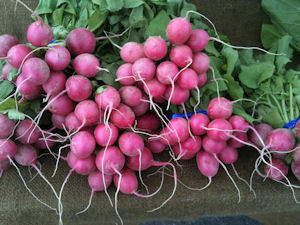 The purpose of the program is to expand access to fresh, healthy local food to low-income shoppers at farmers markets. The Duvall Farmers Market will double the first $10 spent by a SNAP/EBT cardholder each market day. Go to the market information canopy to swipe your card and receive matching funds in Fresh bucks currency. Fresh Bucks matches for fruit and vegetable purchases only, not processed or prepared food, or non food items. Once you receive your Fresh Bucks, you may purchase from any vendor who sells fruit, vegetables, mushrooms, herbs, or vegetable starts. No change will be given for Fresh Bucks. Cha New Life Gardens - Fresh produce, fruits & flowers. Local Roots Farm - Fresh produce & herbs. River Willow Farms - Fresh Produce. 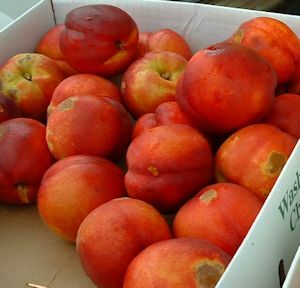 Martin Orchards - Pears, apples, cherries, apricots, peaches, nectarines, pluots & plums. Hayton Berry - Strawberries, raspberries, blueberries & blackberries. 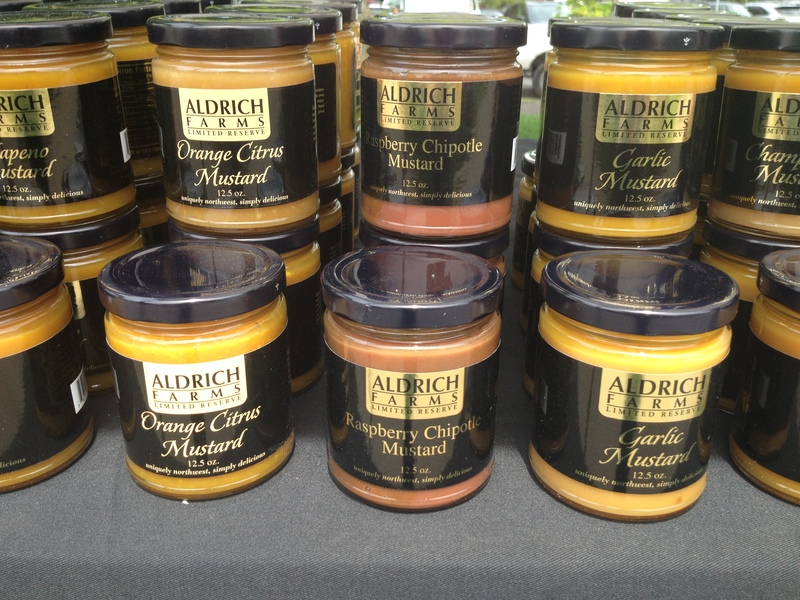 Aldrich Farms - sweet and savory mustards and jellies. Squaw Creek Cattle Company - Grass fed beef with brewer's grain finishing. Individual packages of steaks, roasts, hamburger & other specialty cuts. Back October 9th. 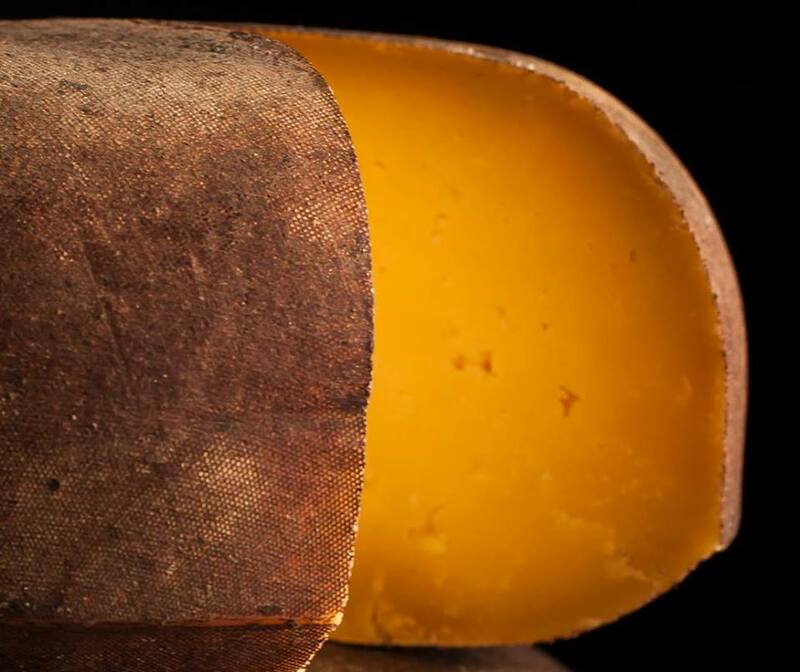 Cherry Valley Dairy - Butter, soft cheeses, hard cheeses & whey. Val's Surroundings Honey - Local varietal honey. Every other week - back September 25th. Magic Chopsticks - Asian food prepared on-site with fresh market veggies. 314 Pie - Australian style savory pies. Married Merchants - Wood furniture and hand appliqued wool pillows. CH Wool - wool yarns, wool rugs & wool products. Martin-Robinson Productions - Hand knitted hats & hand beaded jewelry. Snowflake Cottage - wire wrap & hand beaded jewelry. Lulu's Face Painting - butterflies, tigers and Zombies oh my! Bella Nyah - Boutique Accessories - for little girls & their moms. Mt Forest Beadery - hand beaded jewelry. Picollo Winery - bag wine. Cedar Ridge Winery - bottled wine. Copyright © 2014 Duvall Farmers Market, All rights reserved.